Rise and shine people, time to start the week! I am getting ready to go for my morning run shortly. I forced myself to cross train yesterday because I realized I have been running every day without many elliptical or spin days in between. But I know me. I know that there is always a chance that as soon as I open the front door, the best of cross training intentions may be out the window and I will simply turn left and start running on the path. To prevent this scenario from occurring yesterday, I switched up my sneakers before leaving the house. While I like these Saucony’s, and while they are a running shoe (minimalist), they are not my Gel Nimbus 15’s. I knew back at the end of May and into June that the new Asics felt like they were the right shoe for me. Since I try not to jinx things or speak to soon, I kept testing out the other shoes while still breaking in the Asics just to make sure. Once I decided the Asics were my perfect running companion, I stopped alternating my shoes and have been happily running ever since. 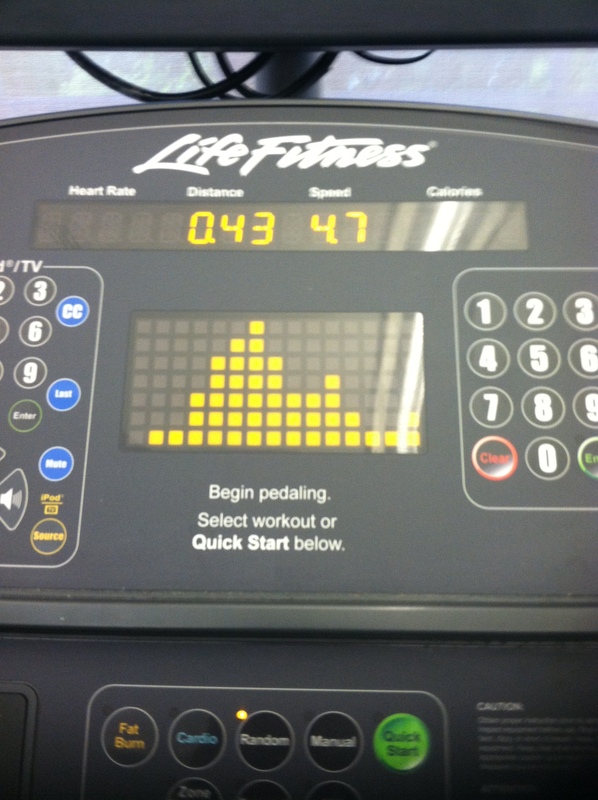 I don’t love the elliptical; I don’t hate it. It is simply there. I always do the random program alternating high resistance levels. I don’t bother plugging in my weight to monitor the calories because a) I don’t know what I weigh and b)I don’t think the calorie counts are accurate. Before I leave for my 5 mile run now, can we quickly discuss for a minute that we are in the last week of July with August to begin on Thursday? The only exciting thing about July ending is that National Cheesecake Day tomorrow. 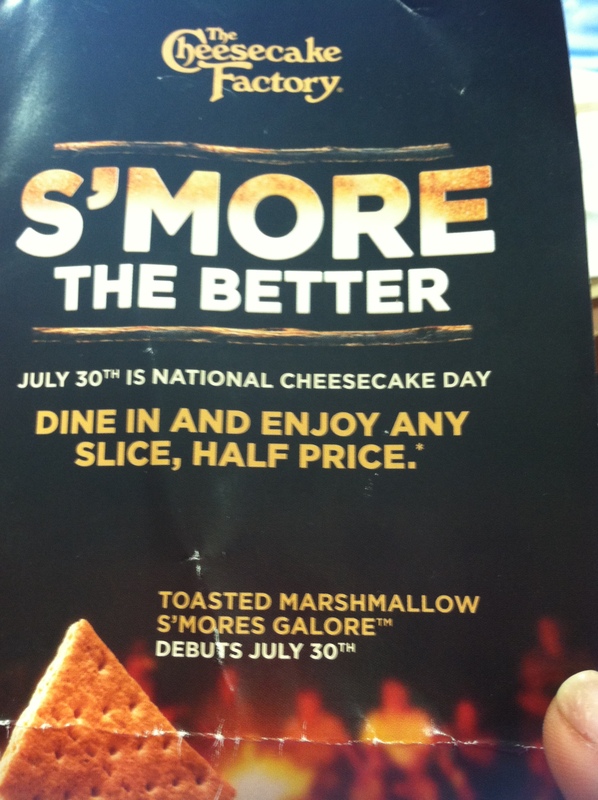 Considering I don’t like cheesecake at all, this holiday would mean nothing to me except for the fact that Cheesecake Factory is honoring the day with the debut of the Toasted Marshmallow S’mores Galore Cheesecake AND EACH SLICE OF CAKE IS HALF PRICE. You know I like a good savings. Hmm, I wonder if slashing the price in half makes the calories half too? I was actually at The Cheesecake Factory yesterday. Not for dessert but for brunch. 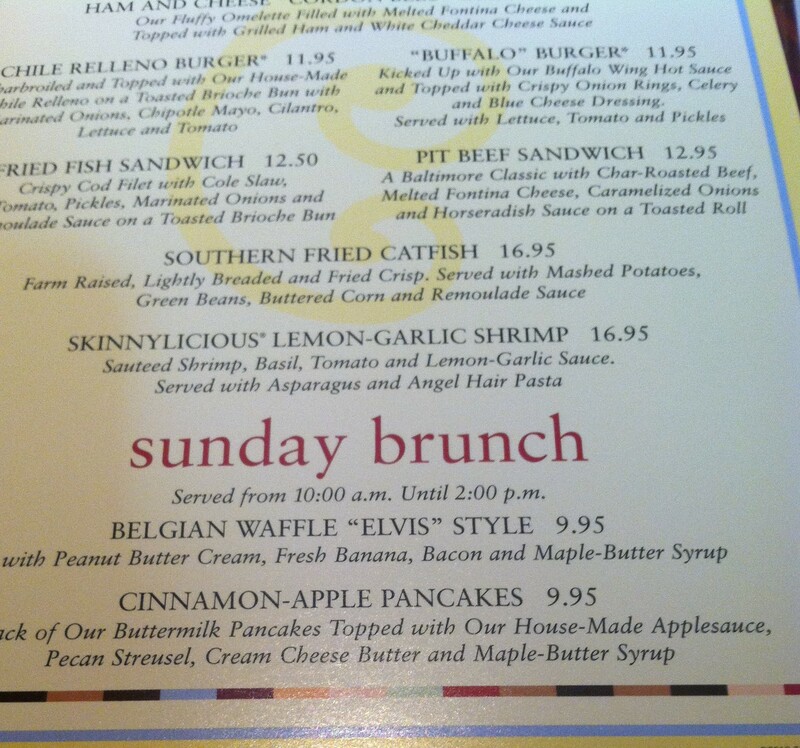 In addition to their regular menu and Skinnylicious menu, they now have a “specials” menu. Now, there were many appetizing featured items on the menu yesterday. But I stick to my favorite BBQ Ranch Chicken Salad (without the chicken). I just can’t go there and order anything else. 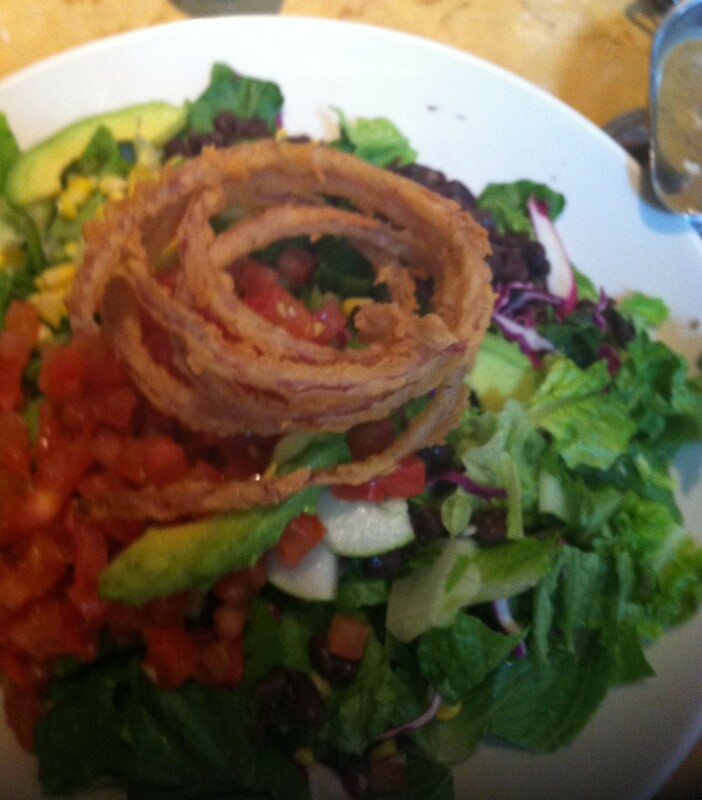 What if I didn’t like what I ordered as much as I love my giant salad? It would just ruin my day. Call me weird but if I am going to eat something, I better enjoy it. If not, it is a complete waste of a meal and of a dining experience as well as a complete and total waste of calories. The little boy though knows how to diversify his selections. 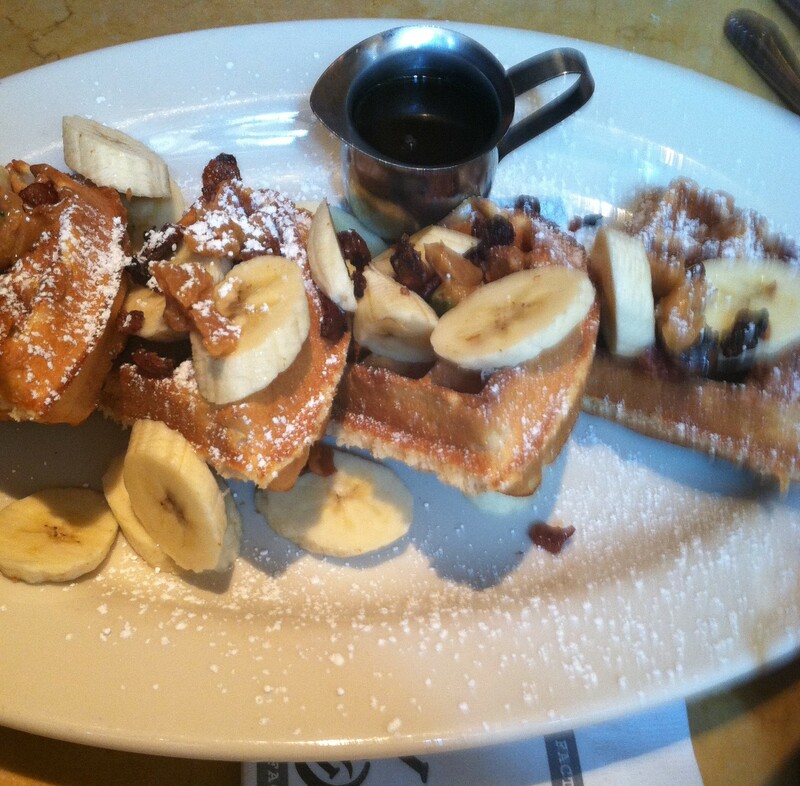 He went with the special “Belgian Waffles Elvis Style” which involved peanut butter, bananas and bacon. Can I just say how nice it is to have a child that loves to eat out and enjoys a good meal? My my my, I have raised him so well. 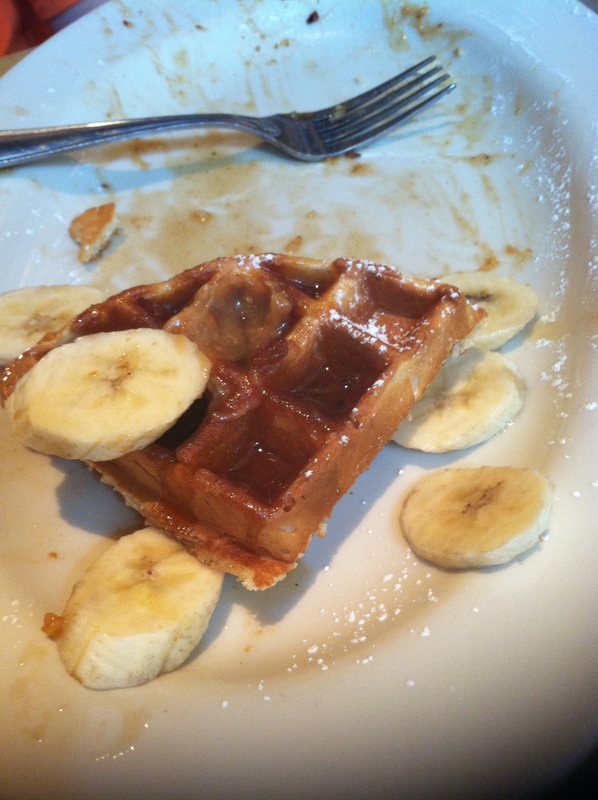 One waffle left = leftovers for this morning’s breakfast. Do you alternate your sneakers? Elliptical – love it or hate it? Do you pay attention to the calories burned? Are you a creature of habit at your favorite restaurants or do you always order something different? Peanut butter and bacon – good combo or gross? I think peanut butter could go with anything. To me it is always going to be known as the Chocolate Cake factory. I went to Cheesecake factory this weekend too! I ordered off that skinny menu- I got enchiladas, which I normally wouldn’t get at a non-Mexican restaurant, but they were really good. So smart to have that menu, even though they have so many choices as it is. The menu there is a bit stressful! I got Adam’s cheesecake for dessert and it was delicious!